As you search for the right personal loan, you may be wondering if any lending institutions, banks, or otherwise, offer guaranteed approval? While many of these companies may advertise such a benefit, make sure you do your research before signing on the dotted line as there’s more to guaranteed approval than meets the eye. What Does “Guaranteed Approval” Mean? As simple as the notion of “guaranteed approval” sounds, it’s a bit more complicated than that. When a lender offers guaranteed approval, your initial thought might be: “when you apply, the lender will approve you, 100%, for whatever reason”. No fuss, no muss, just a guarantee that you’ll receive your loan in due time, right? Not quite. Like we said, it’s very important to take is idea with a grain of salt. Legitimate lenders will never guarantee approval or advertise guaranteed approval. Unfortunately, there’s no way to receive 100% guaranteed approval. All you can do is take the proper steps to qualify. Don’t worry, we’ll explain this further below. Decided against a personal loan? Read about other loan types for credit users. Why Do Consumers Want Guaranteed Approval? No matter what the cause of a consumer’s bad credit is, a low credit score can make it extremely hard to get approved. While they can sometimes qualify with a bad credit lender, their interest rate could be through the roof, which may lead to debt problems down the line. Want to know what bad credit lenders look at when assessing loan eligibility? Find out here. Some consumers have negative credit histories, some want to avoid hard credit inquiries (which damage credit scores), and others don’t have any credit history at all. Whatever the reason, certain consumers may not want their credit checked. If a consumer has applied for multiple loans, all within a short period, multiple hard inquiry notices will show up on their credit report and remain there for several years. These inquiries might raise red flags for other lenders in the future. So, if “guaranteed” approval is offered, many consumers may jump at the chance. This is where credit users need to be cautious. In reality, no loan can truly be 100% guaranteed. Some supposed lenders may offer this, but beware! They may be scam artists who prey upon those desperate for loans. Scam artists are getting more creative all the time. They can be extremely convincing, so it’s important to do research when comparing lenders in Canada. One way that scammers try to manipulate you is by bringing up the idea that they’re risking something by taking you on as a client. This is true, in a sense, because there is always a chance that a consumer can’t afford their payments. Where the situation becomes a scam, however, is when they demand an advanced payment in exchange for the “risk” they’re taking. They’ll probably call it “loan insurance” and will say it’s a mandatory fee for them guaranteeing approval. Look here for a more detailed explanation of loan insurance. All legitimate loan sources need to abide by the laws that govern the lending business in Canada. One of these strict regulations is that no legal lender is allowed to use forceful or threatening language, or pressure you to surrender your personal or banking information. There is no rule that says you must apply for a loan that you don’t feel comfortable about. Most lenders will offer a few different ways that you can pay back your loan. However, it’s very important to never give a suspicious lender access to your bank account. It’s also best to avoid paying using a prepaid credit card since they already have cash on them that a scammer can steal. Once again, they may even offer you guaranteed approval and the price will, of course, be to give them direct access to your finances. 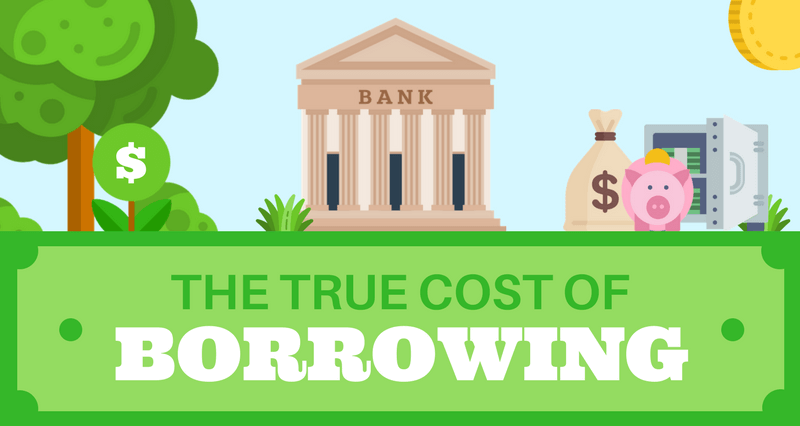 Have you ever wondered what the true cost of borrowing is? Check out this infographic. Remember, no legal lending organization will offer you a 100% approval guarantee. If they do, they may be trying to scam you. Don’t give them any information, walk away and report them to the authorities. Most police departments in Canada have a department dedicated specifically to cases of fraud, identity theft, and other financial crimes. If you’ve already given away your personal or financial information, contact the right companies to have said information modified. Cancel your credit cards and request new banking data. If you can prove your SIN has been used fraudulently, you can even contact the closest Service Canada office to have your number changed and protected. If you think your credit report may have been compromised as well, contact both of Canada’s credit reporting agencies (Equifax and TransUnion) and have them place a fraud alert on your profile. You can even purchase their credit monitoring service, which will keep you updated and alert you of any suspicious activity in your account. Read this to learn more ways of improving your credit health this year. Not only can bad debt ruin your finances, it can get your personal loan application rejected. Despite the fact that some lenders don’t check credit, the majority of them at least look at your financial profile, including your income and your debt history. For obvious reasons, no legitimate lender will grant approval if you already owe money all over town or have a record of defaulted loan payments. Looking for some tips on how to manage your debts? Check these out. Even if guaranteed approval is not really possible when you have bad credit or low financial strength, applying for a“guarantor loan” can drastically increase your chances of securing fast financing, rather than having to wait until your finances have improved. The process involves finding someone with good credit and financial strength to co-sign your loan application, thereby agreeing to take on the responsibility of your loan payments in the event that you can no longer afford them. Make sure they’re aware of this fact because if you end up defaulting, they will have to take on your debt which may cause severe damage to both of your financial profiles. That being said, guarantor loans can be beneficial when you’re looking for near-instant loan approval, as your own credit and finances will not be an issue. Instead, your guarantor’s financial aptitude becomes the deciding factor. Take a look at this infographic to learn more about how the credit bureaus calculate your credit score. The time it takes to gain approval and receive your personal loan depends on your own financial fortitude, as well as your lender’s borrowing procedures. For instance, banks, credit unions, and other prime lenders have policies that prevent them from lending to those who don’t have great finances. Additionally, it often takes well over a week for them to let you know whether you’ve been approved, depending on the type of loan you applied for. Even a simple credit card through a typical banking institution can take weeks to get approved for and acquire by mail. So, if you apply with a prime lender, the best possible thing you can do (if you have bad credit and a low financial health), is to be patient and take the time to heal the blemishes in your financial profile. There may be some secrets your bank is not telling you. Click here to read about them. Then again, what if you don’t have that kind of time? What if you need to cover a pressing expense, such as your rent, tuition, or utility bills? If that’s the case, it might be better to apply with a private or alternative lender. While having a co-signer or other such elements will speed things along and increase your approval chances, choosing the right lender is definitely an essential part of getting fast access to personal loans. Take a look at some more ways to borrow money fast. Will bad credit affect my loan approval? In certain ways. Mostly this depends on your lender. For example, banks and other prime lenders have tighter lending regulations, so your bad credit may prevent you from getting approved there. However, if you apply with a private, alternative, or bad credit-specific lender, your chances will be higher. Can I get guaranteed approval with no credit check? As we said, there is no such thing as guaranteed approval. However, there are legitimate lenders out there who do provide personal loans without checking your credit as part of their application process. You can also apply for a guarantor loan, wherein the credit of your co-signer/guarantor will be checked in your place. Want to know more no-credit-check loans? Check this out. I need a loan right away. Can I get instant approval? Remember, there’s a big difference between the promise of personal loan guarantee and instant loan approval. Anyone who vows 100% approval, no matter what, is probably a scam artist. However, if you apply with the right lender, same-day approval is surely possible. Afterward, you won’t have to wait more than 1-2 business days to receive your funds. Need Fast Loan Approval? Choose Loans Canada! If you’ve been looking for speedy personal loan approval without success, don’t worry, because you’ve found Loans Canada! We guarantee good service and rapid connection with the right lending sources for your financial needs. Contact us today!